They recycle your kitchen scraps. Provide manure for your compost. Cultivate and weed the soil as they search for garden pests to eat. They make good pets for the kids - chickens make great pets if handled correctly; they are fascinating to watch and children enjoy observing and feeding hens and collecting eggs. And they provide you with food - chickens are a source of good quality, high-protein eggs and meat. What sort of housing will they need? You will need to provide a permanent structure which gives your chickens a secure, warm, dry environment where they can roost, sleep, feed and lay their eggs. This needs to get sun in winter for warmth, but also needs to be able to be shaded in summer. Some local councils require the shed to have a concrete floor. Close fitting doors and sealed corners will keep out rats, goannas and snakes. Nesting boxes and perches need to be provided, and food and water dispensers. The fence surrounding the adjoining scratch yard should be of strong mesh that is buried at least 20cm – 40cm into the ground and folded outward in an L-shape to prevent dogs and foxes digging under it. You can also build temporary housing structures, sometimes called 'chicken tractors', which are portable cages that can be moved around the lawn or garden beds so your chickens can work at maintaining your garden, weeding, scratching and turning the soil looking for grubs. You can make a simple run with tomato stakes, cable ties and chicken wire. Providing your chickens have clipped wings, 900mm will be enough height to keep the chickens in the run. For unclipped chickens, the pens will need to be around 1.8m in height. Depending where you live, hawks may be a problem and you may also need to cover the run with chicken wire. Laying chickens are hungry, very hungry. They need a lot of energy to produce an egg each day. Even if your chickens are allowed to roam free in your back garden, they will not get sufficient food from the pickings to be had there. 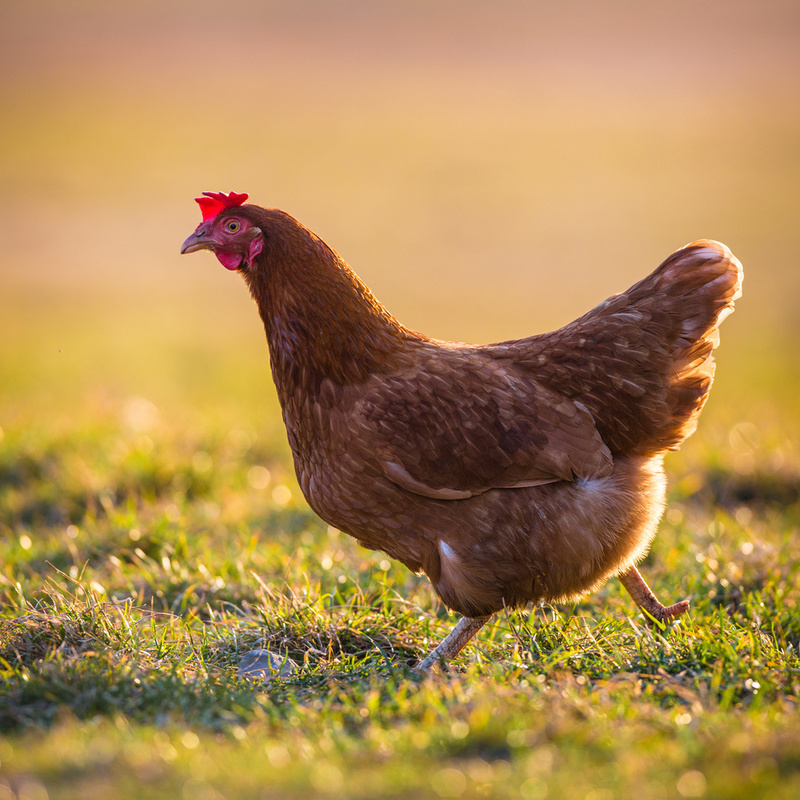 Laying hens consume on average 1kg each per week, depending on the nutritional value of the feed, the temperature and the degree of the birds’ confinement. In other words, if they’re out and scratching they will consume less than if they are confined and bored. Well-fed chickens will lay productively and will only eat as much as they need, so you can plan for supply and demand. You will have to supplement their feed: the easiest way is to buy readymixed mash, pellets or crumble. Layers need added calcium such as limestone chips or oyster grit if this shell-producing material is not included in the ready mixed feed. You could mix your own feed using grains, meat-meal, oilseed oils, vitamins, and minerals to provide a balanced diet. Supplement with green feed, scraps, scratch grain, coarse sand and shell-grit. What about their water supply? You must provide clean, cool water at all times. Chickens get incredibly thirsty and need plenty of fresh drinking water. You must not let their water vessels, pipes or storage tanks be in the sun – it will heat up their drinking water too much. How many chooks should we keep? Keep all of them! You need to keep at least three birds as company for each other. Chickens are social birds, and like to live in small flocks. They instinctively organise themselves into a pecking order. Which chooks are suitable for backyards? The Australorp is a large, soft-feathered bird with glossy black feathers and a lustrous green sheen. It is hardy, docile and a good egg-layer as well as meat bird. The bird’s single comb is moderately large and upright, with five distinct points. The ISA Brown is a hybrid type, not a true breed, which is the result of crossing Rhode Island Reds and Rhode Island Whites. It is known for its high egg production of approximately 300 eggs per hen in the first year. Where would we get our chooks? It is best to buy vaccinated started pullets 16 to 18 weeks of age from a reputable hatchery or grower. (The Yellow Pages is a good place to start). Started pullets are more expensive to buy than day-old chicks, but it is simpler and easier to buy pullets than to rear chicks. Some growers provide chickens with their wings already clipped and ready for the suburban back garden. Buy them in early spring and get them settled in before they start to lay. When will they lay eggs? Normally hens start laying eggs (‘come into lay’) at 18 to 22 weeks of age. They lay for 12 to 14 months, then moult and rest for two months in autumn/winter. Then they lay again for another 10 to 12 months before going into another moult, and so on. They can live for up to 15 years and produce eggs regularly for at least 7 to 10 years. A deep litter of sawdust on the floor will absorb any odour from their droppings, and makes an excellent contribution to your compost heap when the time comes to replace it. Make sure the nesting box is above ground level, at around knee high, as chickens like some height when laying. Provide a couple of roosts, preferably of camphor laurel branches, 4-5cm in diameter, again one at around knee height and one slightly higher. Keep the roosts away from the feeding area so that the chickens can't soil their food and water. Position the feeders so that rain can’t get in to spoil their feed. Provide as much feed as the birds will eat by giving them access to food at all times. They will lay better if they can eat as much as they want to. Chickens love to be out scratching around the garden but are very destructive to plants. You can use the chicken tractor idea to make sure they are working over an area you want worked over. They will appreciate contact with the soil: they need a dust-bath to clean themselves against lice & mites. Keep cages dry, as constant wet conditions breed tapeworms. Snails, worms and insects can spread tapeworms. To keep worms at bay make porridge of wormwood, comfrey leaves, crushed garlic, crushed oats or barley with water. Feed this to your chickens a couple of times each month. Feed should not be stored for longer than three months, and should be stored in a cool sheltered place.